Kyoto is charming because it’s both a place for traditional Japanese crafts, as well as trend-setting designs. I’ve visited Kyoto a couple times now, but every time I find myself discovering new cafes, traditional woodhouse machiya’s (町屋), and beautiful hideouts. This trip, I chose to not visit as many historical sites in Kyoto, mainly because I wanted to explore more of Kyoto’s growing cafe and creative scene where young Japanese artists are trying to blend modern touches with traditional craftsmanship in various fields. Japan Handmade is an example of this–you’ll see some of their creative aesthetics in the pictures of Kaikado Cafe below. FUN FACT: This time around, my dates coincided with the annual summer festival in Kyoto, the Gion Matsuri. While I didn’t participate in any festival events, a lot of restaurants I visited had special menus and tea sets for the matsuri. If you’re interested in watching the iconic float processions in honor of the festival for your visit, here’s a more comprehensive guide. There’s a 夏 in Kyoto Part II coming soon, which will show more of the traditional Japanese shops we visited and our travel itinerary, so stay tuned. I also finally splurged on a kaiseki meal in Kyoto at Kikunoi 菊乃井 本店, a 3-Michelin Star establishment so that will also be included in Part II. This year I’ve been fascinated by design and when I saw the Kaikado objects collection for the first time, I immediately fell in love with Kaikado’s chazutsu. The understated but beautiful airtight designs completely fit my aesthetics. Crafting beautiful tea caddies or chazutsu in Japanese, the KAIKADO brand was established in 1875 in Kyoto. They have since paired up with Danish design firm OEO to create Kaikado Cafe, as well as the Japan Handmade initiative. Both projects aim to breathe life back into traditional crafts and showcase Japanese design aesthetics to more people. Kaikado Cafe is located in a quiet neighborhood, walking distance from the Kyoto Station. When I first stepped into Kaikado Cafe, it was like stepping into a visual showcase of Kaikado objects. The airy cafe incorporates a stunning array of materials–wood, brass, glass, and stone. With minimal decorations, the shelves in Kaikado Cafe are all adorned with Kaikado tea caddies. Each a slightly different shade because as the caddies wear over time, the colors change to a more muted color. You’ll find Postcard Teas London in Kaikado–this was where Kaikado chazutsu caddies were first sold overseas! I meant to visit Kaikado Cafe just to pick up a chazutsu, but somehow I ended up sitting in the cafe, eating, and chatting with the baristas for 3 hours. Apart from Kaikado objects, I learned that the cafe also incorporates others crafts from the Japan Handmade initiative. For example, I ordered a red bean toast and it was served to me on a wooden plate. Turns out this plate is made by Nakagawa-mokkougei, a famous Kyoto woodcrafting studio. All the different objects at Kaikado Cafe has a unique story, so don’t be afraid to ask the baristas about them! I was pleasantly surprised by Kaikado Cafe’s tasty selection of sweets. I loved the red bean toast I got, which was a heavenly combination of freshly buttered bread and sweet azuki. I saw that other tables around me ordered Kaikado’s rare cheesecake, which looked incredible as well. Highly recommend a visit if you love design and want to see some Kyoto crafts at its best. On my second day in Kyoto, I decided to stop by Weekenders Coffee for an ice latte before doing some light shopping in the Karasuma/Nishiki Market area. For those not familiar, Weekenders Coffee has been around since 2005 and they are considered one of the best coffee roasters in town. Of all the different type of coffees I tried this trip, Weekenders’ latte was hands down the creamiest I had. As I walked up to Weekenders Coffee, I had a sudden deja vu moment. It reminded me of when I first found Omotesando Koffee in Tokyo the summer of 2014 and was delighted by the first sip of my coffee. 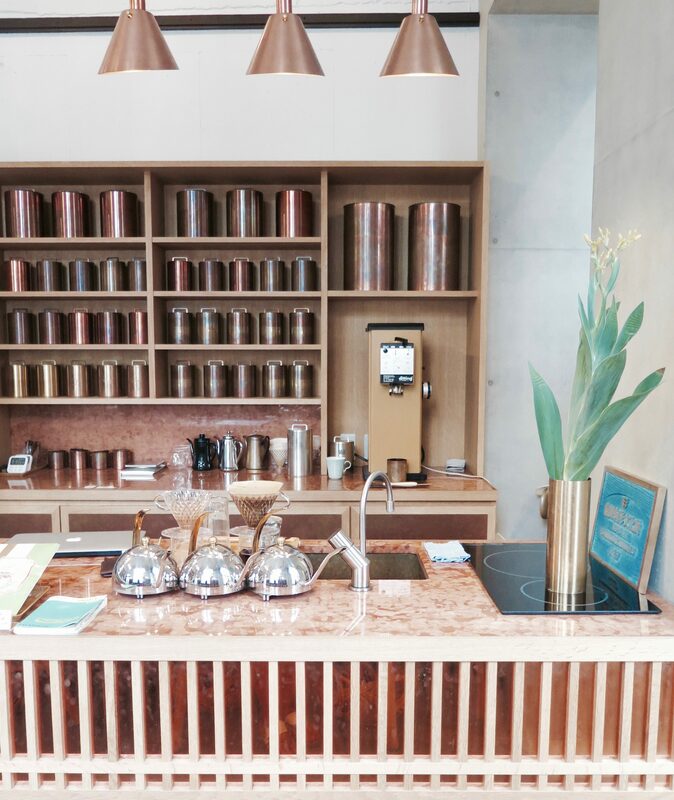 Although it has since closed, Omotesando Koffee’s charming little garden and the tiny little coffee bar was my introduction to Japan’s vibrant coffee scene. Fast forward to Weekenders Coffee, which is tucked away in a corner of a parking lot. Small coffee shops with a big footprint–a Japanese coffee scene signature perhaps. At the heart of Weekenders Coffee is the team’s desire to preserve the traditional kissaten culture. For those interested, they offer public cupping classes on the 2nd and 4th Friday of every month so definitely try to visit during those dates if you can. I actually spent half a day shopping and eating in the surrounding area of Weekenders Coffee. As I mentioned above, Nishiki Market is close by so an entire food market is right next door waiting for you to explore. I enjoyed visiting the nearby Aesop Kyoto which was beautiful, as well as some small stationary stores I stumbled upon. After all, good coffee is the perfect start to a day of shopping and eating. Perhaps a slice of the world’s best tarte tatin can be found in Kyoto. La Voiture is a cafe that was recommended to me by an acquaintance last year. She told me that every time she visited Japan, she wouldn’t leave without traveling to La Voiture to have a slice of tarte tatin. Having lived in Paris for a while, she secretly admitted to me her favorite rendition of french apple tart… was from Kyoto. From one sweet-tooth to another, I had to go. Located in the Heian Shrine area on the corner of Okazaki Park, La Voiture is really a quaint cafe. Yuri Matsunaga, or more affectionately Grandma Yuri, was first introduced to tarte tatin when she visited Paris in her 20’s. Upon returning back to Japan, she opened up La Voiture with her husband and began perfecting her recipe. Although Grandma Yuri passed away a couple years ago, her daughter now runs the cafe and continues making incredible cakes. The slightly charred apples at the bottom had a beautiful caramel finish and the tart yogurt drizzled on top just gave the whole dessert a lovely finish. It’s incredibly soft, with each bite full of slightly tart apples. My first thought after devouring the tarte was ‘I would love to be a regular at La Voiture‘. I’m a firm believer that desserts do not need flawless execution. Instead, recipes made with love often yield the best use of ingredients and flavors. In the case of La Voiture, you really feel the thought that went into picking the best Fuji apples and then baking them for hours afterwards. With a slightly retro interior, La Voiture may be a quaint store with a small menu but one slice of the tarte tatin makes you realize why so many regulars frequent the cafe. On our last day, we had planned on visiting Arashiyama for three things: to see the iconic bamboo forest, have some of the area’s special tofu ice cream, and a cup of %Arabica coffee. %Arabica seeks to push baristas and customers to “see the world through coffee.” Since founded by Kenneth Shoji in 2014, %Arabica has been brewing up amazing coffee in its beautifully designed spaces. While there are multiple %Arabica locations in Kyoto (all stunning interiors I assure you), the Arashiyama shop has a particularly gorgeous blend of coffee and mountain views. After trying %Arabica, I can see why it is so beloved by the locals. The Arashiyama location was so picturesque, the simple act of getting morning coffee there was such a treat. Also, brewing coffee with a gorgeous view must be good for the soul because %Arabica had some seriously beautiful baristas. Although I didn’t get a chance to visit %Arabica’s Higashiyama store this time, I’ll be sure to visit and try a proper latte next time. Maybe if I’m lucky I’ll catch %Arabica’s head barista & latte art champion Junichi Yamaguchi making my coffee. An art space meets boutique hotel, Hotel Anteroom is the perfect place for solo travelers and design-loving people to visit when in Kyoto. I’ve read about it through many Kyoto insider guide books and have been dying to visit for a while now. Once I decided on visiting Kyoto for a long weekend, I immediately reserved one of the last remaining rooms at Hotel Anteroom. Provinscia is a new brand I discovered while I was Hotel Anteroom. This lavender-scented bathing gel and shampoo was so lovely and relaxing, I regret not having purchased a set while I was there! I made some green tea and relaxed with some afternoon reading each day–coincidentally, I was reading about the Ace Hotel through b magazine. In many ways, Hotel Anteroom reminded me of the Ace Hotels’ concept where they blend a hotel space with the local community’s personality, and really make the communal lounge a shared space for not just hotel guests. The interiors of the room were really simple but the stunning cypress bath that accompanied me every night after a long day, as well as the quiet view of the rock garden, made me feel right at home. I especially found Hotel Anteroom’s lounge space very charming. Every detail of the lounge, from the well-stocked whiskey bar to the specially curated books from Kyoto’s iconic bookstore Keibunsha, was carefully designed. You can feel the thought that went into curating every single object in the Hotel and I really appreciated that. Stylish interiors, curated books, a whiskey bar… AND of course, good food. Anteroom Meals is the hotel’s dining area where I had my breakfast buffets of salads, fruit smoothies, and the freshest pita wraps for 1,000 yen/person. Using fresh ingredients from a locally-based vegetable distributor, I started my day off everyday at Anteroom Meals. It really goes to show, simple food with good ingredients go a long way. Hotel Anteroom is definitely such an unique place to stay at. Every day I felt like I started and ended my day in my own special space. Definitely don’t be daunted by the fact that it’s in a quieter neighborhood. The Kujo subway station is a 5 minutes walking distance, and within two stops you’ll find yourself right in the middle of Kyoto. I wanted to share the above places all together because I felt that they all fit into a narrative of Kyoto I was privileged to discover for the first time. Each place was the manifestation of a desire to preserve and showcase a craft, whether it’s coffee or bronze chaztusu. In talking to the storekeepers and baristas, I learned about the different founders’ stories and was inspired by their wealth of knowledge and passion. I’ve linked all the stores’ websites above, so you can read about the founders’ incredible stories yourself. My life’s mission is now to find some way to get to La Voiture and try those tarts (and Opera cake! Mmmmmmm….). C’mon, lottery! So glad you enjoyed it! This was honestly one of my favorite trips I’ve taken in the past couple of years–definitely encourage you to visit some of the places above. La Voiture’s apple pie will always hold a special place in my heart.